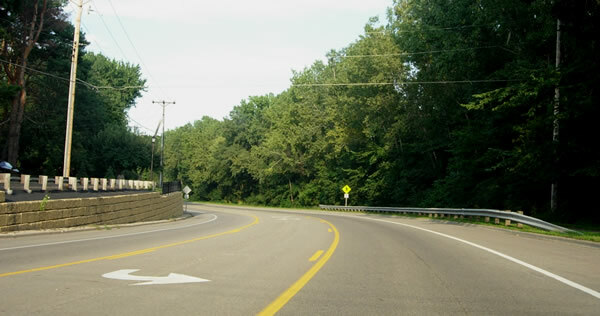 Highway 13's original alignment at the Scott County line was on Williams Drive (former County Road 34) in what is now Burnsville. 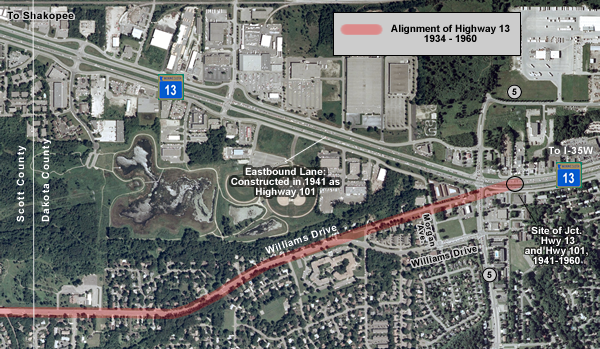 In 1941, a new highway was constructed north of Williams Drive along what is now Highway 13's eastbound lane. Although it was probably planned as a new alignment for Highway 13, the new road ended up being marked as an eastern extension of State Highway 101 instead. 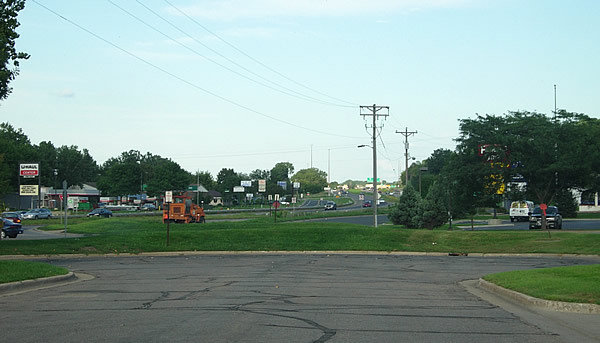 The two highways met just east of the modern junction of Highway 13 with County Road 5. In 1960, Highway 13 was upgraded to four lanes at the just completed I-35W interchange. The new four-lane section of Highway 13 was constructed to merge directly onto old Highway 101, and Highway 13's route was moved off of Williams Drive. 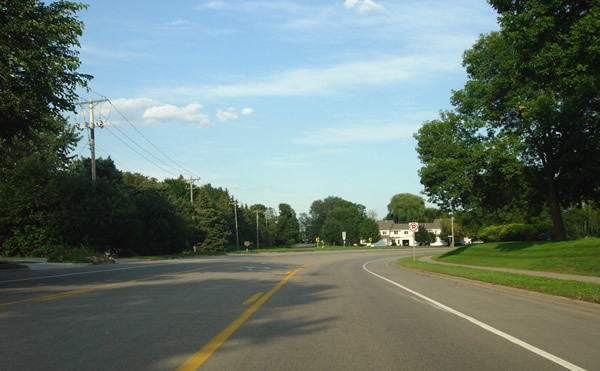 Highway 101 and Highway 13 shared the highway to Savage until 1963, when Highway 101's route was truncated at the west junction in Scott County. 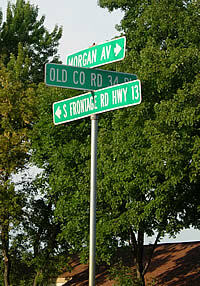 Williams Drive became County Road 34, but was eventually turned back to the city of Burnsville. 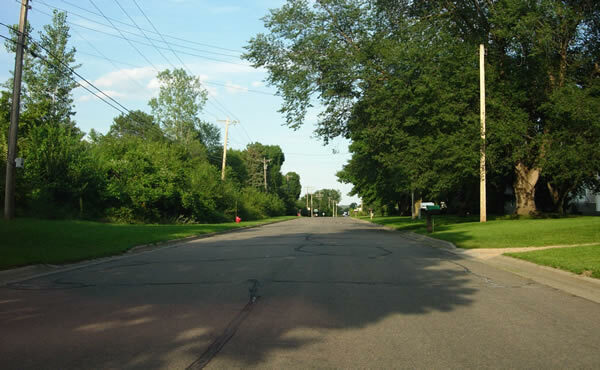 Today, Williams Drive serves as a typical suburban drive, with little to indicate that it was once a trunk highway. It has been significantly widened and repaved since being bypassed in 1960. 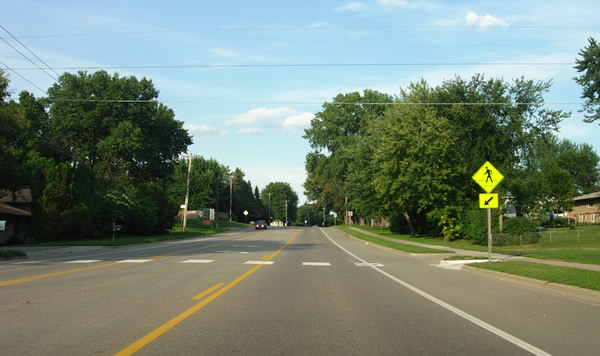 The eastern end of Williams Drive was realigned to intersect County Road 5 a few blocks south of modern Highway 13 at some point in the late 1970's. A section of the eastern end of the old alignment remains as "Old Co Rd. 34 Place", accessible via either Penn or Morgan Avenues. 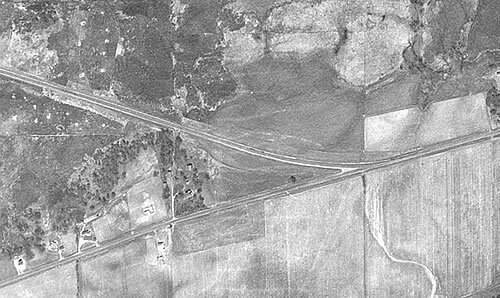 Above, an aerial photo from 1947, showing the old junction of Highway 13 with 101. Scans from the 1942 (left) and 1946 (right) official highway maps. The 1942 map erroneously showed Highway 13 using the new alignment that had just been constructed in 1941. The 1946 map corrected this, showing Hwy 13 using the old alignment on Williams Drive. Photos taken in August, 2006. All photos are from the eastbound perspective. 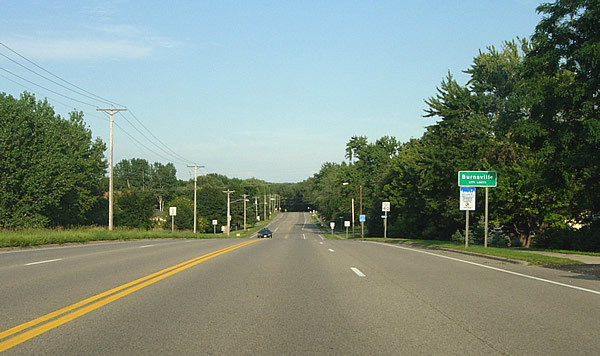 Entering Dakota County on Williams Drive. Looking east, just before the intersection with Penn Ave. The road has been realigned here to curve south towards the modern junction with County Road 5. The original highway continued straight ahead. Looking east on Old County Road 34 Place. This short stretch of old highway is now a sleepy suburban street. Old County Road 34 now ends at a cul-de-sac, just short of County Road 5. The original highway continued straight ahead onto the alignment of modern Highway 13 (visible). Just ahead is the site of the old junction of State Highway 13 with State Highway 101.